Whether you own a stand-alone retail shop or manage a larger commercial property for a shopping mall, strip mall or another type of retail center, it is important to have a plan in place before the first snowfall for commercial snow removal. Snow removal services are the best way to reduce liability risks associated with snow and ice hazards on your commercial property, protecting you from lawsuits due to neglect. It can be difficult to have your in-house staff take over duties for shoveling walkways, clearing out parking lots, and maintaining entrances in addition to their regular daily work orders and services. In addition, the cost to purchase all of the equipment and safety gear necessary to do the work effectively and efficiently can be quite expensive. 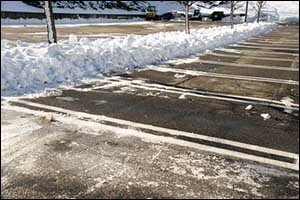 As a result, outsourcing Dartmouth snow removal to a reputable company is the best solution for most retail businesses. In addition to making sure that your parking lots and driveways stay open for business during the winter months, there are also legal considerations when it comes to snow removal in Dartmouth and the surrounding Southeastern Massachusetts region. There are different requirements for each state, which can be a real challenge for business owners who have properties throughout the New England area. Hiring a team to provide professional snow removal services that specialize in commercial snow removal in the local area has some significant benefits. Their knowledge and experience of local laws regarding Dartmouth snow removal for local, county, and state government regulations can be advantageous. Each government entity and the corresponding court in different states will come to different conclusions regarding liability for snow and ice hazards. They take into consideration different facts, such as how long the snow or ice remained on the property, where the injury or property damage occurred, how the snow or ice accumulated in the location, as well as any behaviors of the injured party that may have caused the incident to occur. Your legal obligations according to statutes and legal doctrines for your local area will also be taken into consideration, so it is important to protect yourself from liabilities by using reputable commercial snow removal services wherever your property is located. To be certain, you may want to hire an attorney to ensure that you are living up to your legal obligations in every way. Locating a company that offers Dartmouth snow removal according to your needs and property requirements is important. There are a variety of different snow removal services to consider, based upon your unique situation. You will want to work with a professional service who can meet your demands and fit within your budget. Trustworthy, reliable, and dependable are just a few of the words that should be used to describe a company that offers snow removal in Dartmouth and the surrounding South Coast region. You don’t want to lose business the day after a significant snowfall because your commercial snow removal provider flaked out on you. Check references, get referrals, and ask around about the reputation of the snow removal services provider before you sign any type of service contract. The company should be prepared to remove snow and ice hazards on an as-needed basis, make themselves available to you following a big snowfall, and maintain safety standards with de-icing products and other services, according to the needs of your business. Retail shopping malls will require different services than stand-alone shops. That being said, office complexes, hospitals, industrial properties, and residential developments will all require different snow removal services as well. Working with a company that has experience and knowledge of the needs for your type of business is extremely helpful, especially if you aren’t sure what you will require to meet the demands of local laws and ordinances. If you own a business or commercial residential property in Dartmouth, Massachusetts or anywhere in the surrounding South Coast region, contact ABLE Asphalt, Inc. for a FREE estimate on any of our commercial snow removal services. We provide top quality snow removal services in the local area for a variety of different industries. We have the manpower, equipment, and knowledge necessary to remove snow and ice hazards from your property while protecting your asphalt paving from damage. Give us a call at 508-636-9700 to get more information about Dartmouth snow removal or to speak with one of our team members about any of the other professional commercial and residential services we provide.